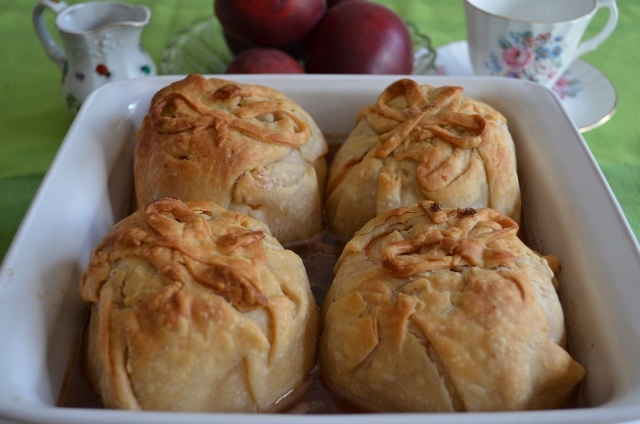 This is a quick way to make apple dumplings using refrigerated pie crust to wrap around the cored and peeled apple. Even though the recipe does not use home-made pie crust, by the time you add the apple and drizzle the syrup on top, it tastes great. If you are a fan of nutmeg, add 1/2 teaspoon along with the cinnamon. 1. Bring 1 1/2 cups sugar, 2 cups water, 1/4 teaspoon cinnamon to a boil in a saucepan over medium-high heat, stirring constantly; reduce heat, and simmer stirring occasionally, 10 minutes. Remove from heat and stir in 1/4 cup butter. Set aside. 2. Combine 2/3 cup sugar and remaining 1/4 teaspoon cinnamon. 3. Cut pie crusts in half, and roll into 8-inch circles. Place 1 apple in center of each circle. Sprinkle each evenly with sugar mixture; dot evenly with 3 tablespoons butter. 4. Fold dough over apples, pinching to seal. Place in a lightly greased 13 x 9 inch baking dish. drizzle with the liquid syrup mixture previously prepared. 5. Bake at 375 for 40-45 minutes. Well, maybe a little will be okay… Enjoy! If sugar is your problem, ask the doctor if you can substitute Splenda. Splenda is a bit sweeter than sugar so put in a little bit less. If your problem is the fat in the dough, that would be another issue. An idea I’ve used when I am on a diet is to take Phyllo dough available in some grocer’s freezers. It is a very thin dough used in Baklava. It has a lot less calories than regular pie dough so it’s a lot healthier. Keep it in a tight plastic bag so it doesn’t dry out and get stiff. To make the dumplings, warm it to room temperature so the dough becomes soft and pliable. 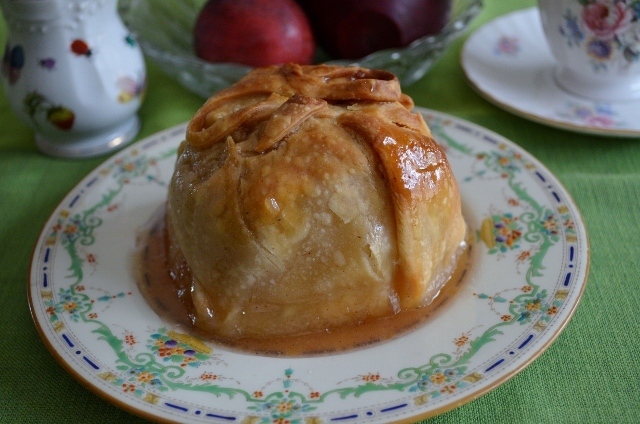 Now, place your peeled and cored apple in the center of a square of dough. Pull dough up over edges and overlap at top of apple, using a bit of water to seal it. (It might tear a little as you mold it around your apple, but be patient. It will still taste good. Warm sugar-free pancake syrup and pour 1-2 T. over the top of it. Bake, as usual. Keep an eye on the dumpling so it doesn’t get too brown. “Where there’s a will, there’s a way!” Let us know how it turns out. Thanks for the ideas. Sounds good. yum! I was just looking at some apples that need to be eaten … gonna have to try this! Apple dumplings are a great fund-raiser. Granted, they’re a lot of work, but that’s why they’re so great. Most don’t have time to make them, but if your group can churn out a big batch over a day or two’s time, they really sell once people taste them. Be sure to drizzle them with syrup on the top – homemade is better.